Alex and Samantha, originally from St. Ignace, Michigan, lived in Asheville, North Carolina, for nearly five years. They had their first two children, Margot and Marion in Asheville. 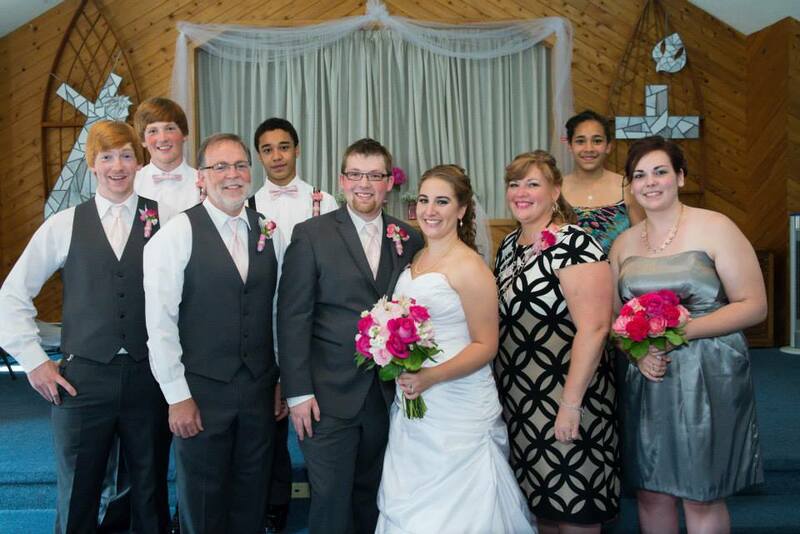 In the spring and summer of 2013, Samantha and Alex began praying about moving home. Not even one year later, their prayers were answered and they purchased St. Ignace Greenhouse & Florist. 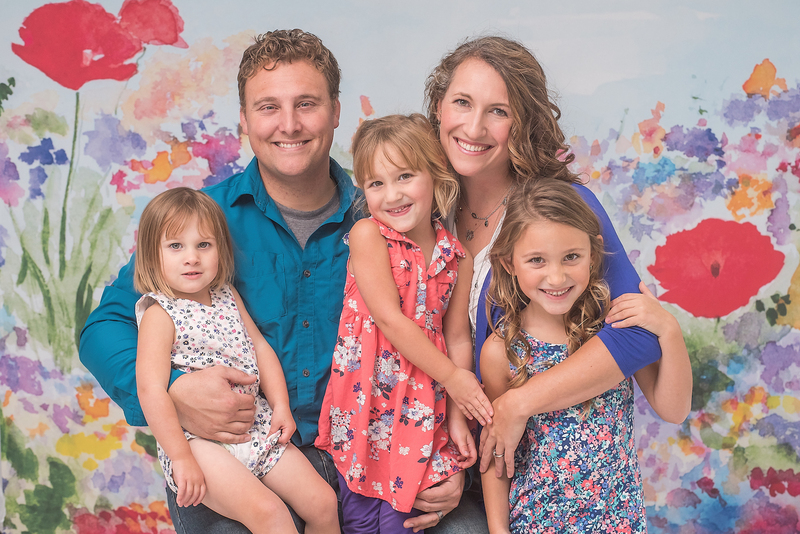 In the summer of 2015, they welcomed their third daughter, Marley, into the family. As high school students, both Alex and Samantha had experience in the floral/landscaping industries. Alex worked for a local landscaping company, Cedars of Mackinac, and Samantha actually worked at St. Ignace Greenhouse & Florist. Alex went on to hold a variety of jobs, including working on freighters in the Great Lakes and lift boats in the Gulf of Mexico, before returning to work in the soil. 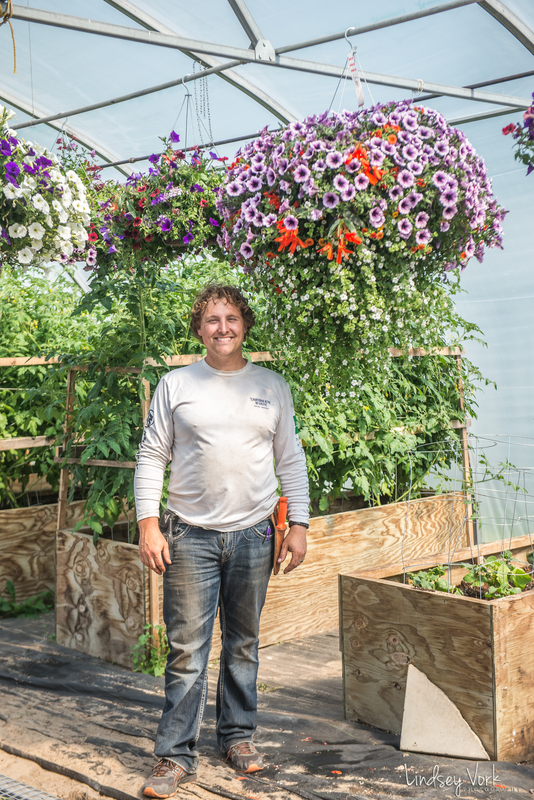 Alex focuses his energy on working in the greenhouse with bedding plants, vegetables, shrubs perennials and his very favorite, hanging baskets. 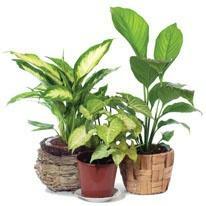 Alex's love for life-long learning has helped him to develop into a wonderful grower and care-taker of his plants. Alex enjoys playing with new combinations for planters and hanging baskets and he especially loves using blooming vines in his designs. Samantha graduated from Grand Valley State University with a B. A. in Hospitality and Tourism Management with an emphasis in Event Planning. She worked as an Event Coordinator at DeVos Place in Grand Rapids, Michigan, and then as the Manager of Volunteer Resources at a non-profit in Asheville, North Carolina. 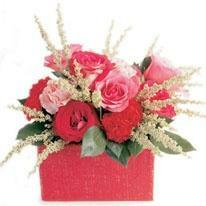 Samantha mainly works in the floral department with cut flowers and wedding floral. 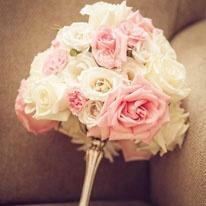 Her experience in the event industry gives her a unique ability to work with weddings and special event floral. In 2018 after taking many classes in floral design and studying the industry inside and out, Samantha passed her boards to become a Certified Florist. Also in 2018, Samantha was nominated for (and won!) 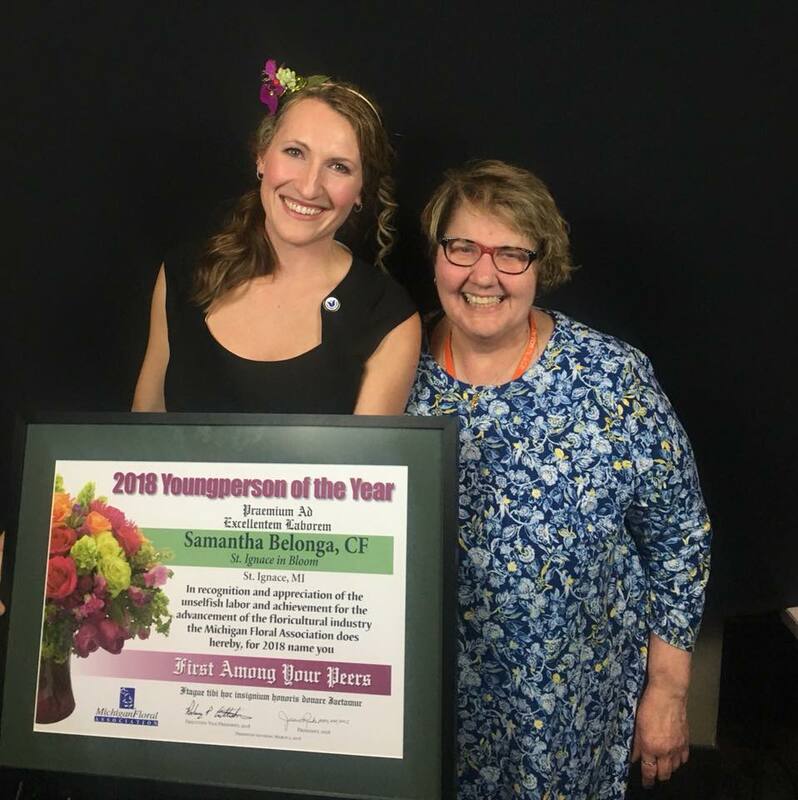 Young Person of the Year from the Michigan Floral Association. Pictured with Samantha is her friend and mentor Jackie Burrell, owner of Flowers From Sky's The Limit in Petoskey, MI. Alex and Samantha love this business because of the people they get to interact and work with on a daily basis. 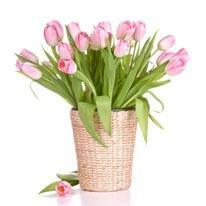 Providing customers with a great experience no matter what their floral or plant needs is a top priority! Left to right - front row: Jonathan Wyse, Grampa Foote and Jordan Wyse. 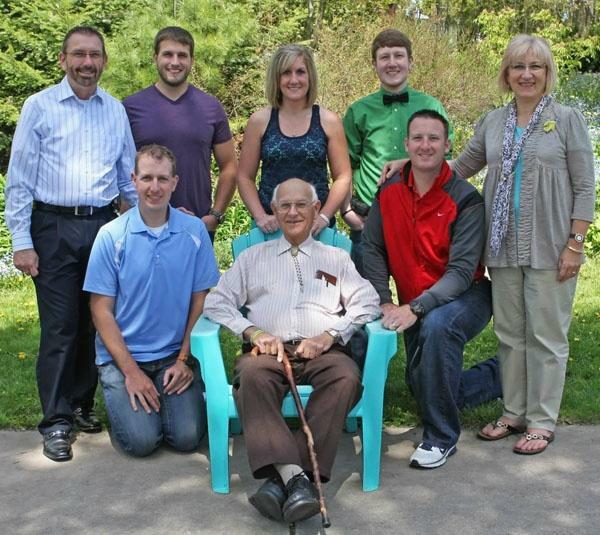 Back row: Merv Wyse, Jess Wyse, Meredith Wyse, Josiah Wyse and Judy Wyse. Having loved flowers and yard work for as long as I can remember, a seasonal job at St. Ignace Greenhouse and Florist was the perfect fit for me. I could continue to homeschool my children throughout the school year and enjoy spring in the greenhouse and summer in the flower shop. When my children finished school, I began to work fulltime and have subsequently worked on hundreds of weddings, as well as staying involved in the daily operations of the flower shop. As a lifelong resident of St. Ignace, my passion for sharing the beauty and romance of the area continues as I assist customers who come to us locally, nationally, and from around the world. Beverly DeMers comes to St. Ignace in Bloom with twenty-four years of floral design and four years of florist management experience. Her interest in floral design began when she was eleven years old. 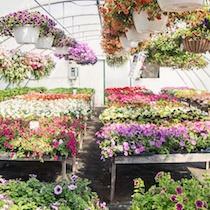 Her first floral design job was with Royer's of Palmyra, PA, one of the East Coast's largest high-volume floral chains. She was susequently employed by Accents Floral Design of Middletown, PA. While in their employ she was the designer for the Pennsylvania Governor's Mansion and Hotel Hershey, the four-diamond, official resort of the world-famous Hershey Park. 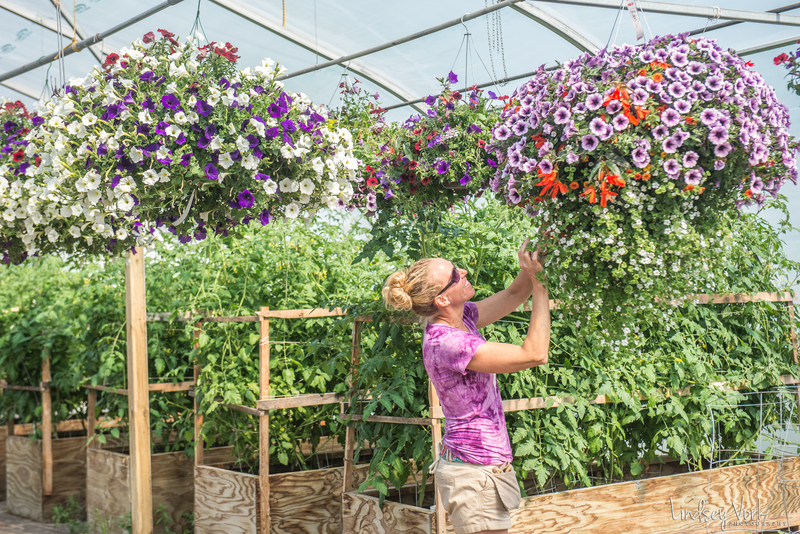 Her final employment before coming to St. Ignace in Bloom was as both a floral designer and manager for Stauffer's Garden Centers. Under their employ she was responsible for making the arrangements for the Eden Resort of Lancaster County, Pennsylvania, as well as arranging and decorating for their photo-shoots. Additionally she was responsible for making arrangements for celebrities Anne Murray, Rick Springfield, and the band To To during their tours at the American Music Theatre. 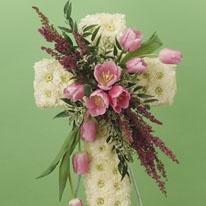 In addition to her full-time jobs, Beverly has free-lanced as a floral designer for weddings. 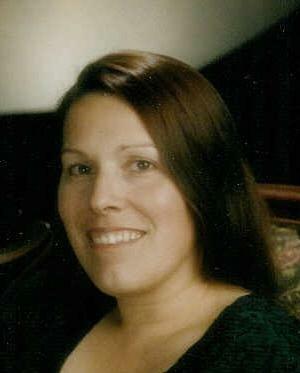 Jessica is a busy wife, mom, hair stylist, and a new grandma in addition to her work in the flower shop. Jessica loves any combination of flowers that have COLOR and she enjoys getting creative with corsages and boutonnieres for weddings and prom. Everyone in the shop loves to have Jessica around because of her fun-loving personality and her contagious laugh. Jessica loves to listen to music while she designs and she always fills the shop with joy. Robin's love for flowers, plants and dirt in general is evident from the moment she greets you in the greenhouse. She can commonly be found chatting with flowers as often as customers! Robin is a wife and mother and always enjoys spending time with her sons and watching them play hockey. She also loves to take her fur-babies for a nice walk and a swim in the lake with her husband Thomas. Robin always has a smile on her face and she often brings in snacks for crew!